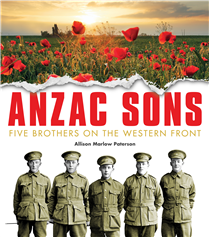 Allison Paterson is the author of the 2016 ABIA and CBCA longlisted title Anzac Sons: Five Brothers on the Western Front, the children’s version of the adult non-fiction title Anzac Sons: the Story of Five Brothers in the War to End All Wars. She decided to write Anzac Sons to honour her family after the collection of over 500 letters sent from the Western Front by her grandfather and his four brothers came close to being destroyed. 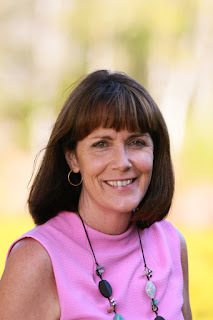 Her children’s picture book called Granny’s Place is related to Anzac Sons, being inspired by delightful childhood memories of her grandparents and their farm. Shearing Time is her latest release and is a companion story to Granny’s Place. Allison is a judge for the Redgum Young Aussie Writers’ Awards, a children’s book reviewer and was a teacher-librarian for over twenty years. The May Gibbs Children’s Literature Trust recently awarded Allison a 2017 Creative Time Fellowship, four weeks in Canberra just to write! In the years of 1914-1918 over 330,000 Australians served their country in a war far from their homeland, more than 60,000 of them died. Five of these Australians were brothers; three of them were destined to never return to the home they loved. The Great War brought enormous sorrow to families all over the world. In Australia there were few who escaped the fear, nor the tragedy. This is the story of the Marlow brothers. This powerful children’s book brings their story to life for future generations. It is a tragic tale of mateship, bravery and sacrifice; a heartbreaking account of a family torn apart by a devastating war. It is a pledge to never forget. Based on the original title Anzac Sons; the Story of Five Brothers in the War to End All Wars, this important children’s book compiled by the granddaughter of a surviving brother tells the true story of brothers’ service, the impact on the family and community and weaves through the facts and history of the Great War and battles. Combining beautiful prose and imagery including photographs, maps, letters and facts, the book will reach children of a variety of ages. Children, teachers and parents can read the letters her ancestors wrote from the trenches, walk in their footsteps and remember all those who have served throughout the generations to defend our freedom and our way of life. Anzac Sons (the children’s version) truly is a remarkable and inspirational book that will transport younger readers from all ages into the hearts and minds of five brothers who served their country and, together with their fellow comrades, inspired a nation. While the events of WWI could arguably depict human nature at its worst, the war also generated many examples of amazing courage, selflessness and resilience, all qualities of great character. There are many familiar stories of truly remarkable and heroic Australian soldiers but, for the first time, I could appreciate and admire those stories that are not so familiar, from the family left at home to manage the farm, to the Australian soldiers who saved my Grandfather’s life when he was buried alive, to those who lost not only loved ones, but gave way their homes, villages and cities to the tragedy of battlefields. The capacity of human nature to pick itself up, overcome adversity and rebuild is both astounding and admirable. Walking the battlefields of the Western Front has left a resounding sadness. In this very small part of the world millions of people were killed, across a farmer’s field thousands of men disappeared; it was difficult to comprehend. History is fascinating and I enjoy research - there is a lot of detective work to be done! Consequently, the process of creating Anzac Sons was very satisfying. There are so many interesting discoveries to share but one that resonates is how delays in communication brought tragic consequences on both a personal and grand scale. It took at least six weeks for a letter to reach Australia from the Western Front, often longer. When George Marlow was killed his family in Australia was notified by telegram, letters he wrote arrived in the mail for several weeks after. His brothers, who served in another battalion but were not far away, knew George had been injured but did not receive word that he had died for six weeks after his death. They kept searching for him, assumed he had been sent to England and continued to write letters to their family advising them that George was recovering. Our capacity to instantly communicate today is something we can easily take for granted. Anzac Sons is adaptable for Primary studies of Anzac Day and Remembrance Day and a valuable resource containing primary sources for secondary studies of the Australian Experience at War.